The significance of CP’s selection of Dream to develop 30 of its surplus properties this week, largely overshadowed by the the demise of Target Canada, cannot be overstated. The Dream Van Horne Properties joint venture opens the door to the development of a wide variety of prime Canadian and U.S. urban locations to mixed-use developments starting as soon as 2017 though primarily over the long term. A recent CP investor presentation mentioned a surplus real estate portfolio of more than 45 properties suitable for development, sale or lease that cover more than 4,000 acres, according to a report issued by Sam Damiani, director of institutional equity research, real estate for TD Securities Inc. It’s estimated CP’s surplus real estate is worth approximately $1 billion undeveloped and more than $2 billion with investment. That information alone indicates the underlying value of this agreement will make it one of the largest real estate deals of 2015. A back-of-the-envelope calculation suggests that ‘$2-billion with investment’ is likely an underestimation and that the built out value of the property is going to climb if not skyrocket. Take Lucien L’allier, a three-acre site across from the Bell Centre in downtown Montreal with direct access to metro and commuter lines, centre-ice in the city if the not the province for example. It has massive development potential capable, if the zoning was in place, to accommodate a high rise office building and/or a hotel with all the associated retail. The South Edmonton Yard, a 92-acre site across the river just south of downtown Edmonton is another example of a property included in the deal with scale and location to become a new community. The other two sites in the news release Schiller Park, a 75-acre site in Chicago close to O’Hare airport with “excellent highway access and adjacent commuter transit station and Obico, a 74-acre site near Kipling Ave and Dundas St in Toronto’s west-end industrial submarket have equally expansive development potential. These four properties mentioned in the news release as well as the remaining 26, as yet undisclosed sites included in the deal, indicate massively understated long-term value and implications for Dream Van Horne Properties. 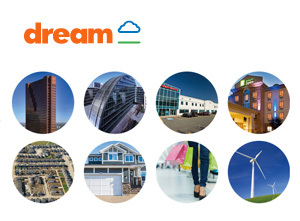 If Dream’s repositioning as a community builder in recent years is a corporate model that “sealed the deal” with CP it may mark the beginning of a new kind of real estate company emulated domestically and abroad who are true city builders. The deal also takes the idea of “transit oriented development” to a new level. Railway properties across the country pass through prime development locations in towns, village and cities. The CP Dream deal sets a precedent for similar agreements as mechanism for the rejuvenation of derelict property in municipalities along railways. It may also provide a way to finance inter=city rail lines such as the long overdue Quebec Windsor passenger rail service where re-develop of rail-side property might offset the cost of the infrastructure. There is a mountain of detail left out of this recent announcement such as who were the other bidders and the nature of the agreement. We are going to hear a lot more about it in the days and years ahead.